It was early morning, the sun was just coming over the the edge of the fast sea the shimmered with every wave that burst over. It was peacefully calm and quiet, a whispering breeze flowed down the coast, bring the sweat sent of salt and fresh air with it. The sea led into a small cove estuary that flowed inland between two giant boulders, which looked like guards of the river mouth. Up the river and hidden within the cove was a mystical looking lake. With a giant water fall with an unseen cave, fuchsia, teal and ice blue flowers that size of trees glimmered around the water's edge. They seems to go nicely with the sentry willow trees, that rose high into the sky. The clear teal blue liquid rippled as the magenta and ice blue creatures played in it with it's misty surface. Splashing, laughter and another language filled the air like bells. They tolled out down the river to the sea and it's sand beach. "I've never seen the ocean!" Laraine exclaimed out loud in awe. The brilliant sea colours crashed over the oil black rocks outlining the rocky cliff. Among the glittering and magical view, the salty and refreshing scent of the sea had taken Laraine's breath at it just staring out at the end of the world. "The view! The scent! The-" she closed her eyes and inhaled a lung full of the salty air, "The taste!" It was too beautiful to describe as Laraine melted silently, landing on her knees. She shuffled over to the edge of the cliff and gently removed her small sandals from her tiny feet. Placing them to the side she Leaned back, using her palms to stable her. Closing her eyes, Laraine let her head fall backwards as a cool burst of sea air splashed over her and into her hair, lifting it about in a fiery mess. She opened her eyes and swung her feet back and fourth debating on a swim or not. She didn't really have anything important or worldly on her other then her clothes, but she assumed only a pervert would try and steal those and as far as she could see, there were no creatures within a mile of her. Standing up, Laraine wobbled from side to side, stabling herself quickly with her arms out before chuckling to herself. "I should probably spend less time day dreaming or the sea will swallow me up!" She spoke in a cheerful tone. As Laraine continued to enjoy herself, she picked up her sandals and chose to find a lovely spot along the beach to sit down on or collect shells from, if she could find any. All-the-while she would hum to herself in her musical voice, listening to the ancient sounds from the sea. Bending over forward at a shell that caught her attention she could feel the cool salt water lapping up at her ankles which made her smile with the delight of a two year old discovering the world outside. Her deep purple eyes sparkled at the sight and pocketed her small treasure. The waves shrunk back towards the sea and another one rolled in, sweeping the sand out from under her feet. Laraine curled her feet up in the sand, the small soft eroded and sanded-down rocks catching in between her toes. There she decided she'd go for a swim. Moving quickly, Laraine spotted a huge rock that was a fair height and way away from the water, which would allow her to change in peace before hanging up her clothes on the large rock before diving into the almost docile sea. Closing her eyes yet again, Laraine soaked in some rays from the bright orange flare of the sun before running into the sea before running out of it. "It's so c-c-c-old!" She shouted in surprise, clinging to her bare shoulders with her cold wet hands. She thought it would be warm, but she guessed wrong. "Maybe I shouldn't go in..." She walked over to the edge and let the water swirl around her feet in a bubbly mess. "Ah, screw it!" She grinned before running back into the icy cold water, which after a few minutes found it pleasantly warm after swimming around for a bit. Laraine hadn't realized that was was moving farther and farther out until the huge rock started to look smaller. "Oh!" She said surprised, pulling out a full speed of strokes with her arms in order to reach the shore again. She was getting tired now, but was nearing the shore, though not very quickly. Finally, after her exhausting swim, Laraine laid down in the warm sand with her proper clothes on as she looked at the setting sun. "It's getting late." She spoke to her aching body that didn't want to move. "Better get to higher ground before the tide comes in..."
The magenta girl broke through the surface of the lake shaking her hair, water sparkled out in all directions. She used her powerful dolphin tail to thrust up to breast out of the water. The sapphire dolphin gem shown an eerie royal blue that light up the whole area of a good five feet all around her. Her blue crescent moon birth mark and the water horse on her right hand stood out against her peach skin, but were not a glow. Her sky blue eyes shown brightly from her necklace and joy she felt. The ice mare surfaced in front on the girl. She came out so that her mane was flowing across the liquid's top. Her magenta eyes were full of love, she leaned forward and nuzzled her bonded in the neck. She nickered happily and then submerged again, with hardly any sound or ripples resulting. The Mare maneuvered herself to come up under the her girl, so that she sat in the middle of her blue coated back. The girl smiled and giggled again, interlacing her fingers into the silky ice mane. She positioned herself to lay on her stomach and immersed her hands into the mare's mane. Both looked at each other and said Kyra's Peace, both creatures seemed to fuse into one, it was hard to tell where the magenta began and the blue melted. Both took off down stream underwater, the way being light a glow from the sapphire gem. The torpedoed down the river to the mouth, did a time turn around a small rock in the center of the opening. Then in a flash of blue and fuchsia, zipped back the ray they came, as in a race. Laraine was laying faced down in the sand. She had tripped over her loose sandal and was now chocking down a handful of sand. Digging her nails into the sand, she pushed herself up weakly with her skinny arms as her nails, and now her palms, pressing harder as they started shrinking into the sand. Throwing her weight back, Laraine found herself sitting on her knees panting. Before that, she had forcefully inched herself away from the lapping salty waves. She had been able to make it to her feet, but her downfall was the dizziness of her head and the weakness of her feet that had actually tripped her as she stumbled into the sand. She started sputtering and spitting out the sand lodged in her mouth and throat cursing under her breath for being so clumsy. Right now she just wanted to sleep, but feared the sea sweeping her away if she slept now, too close to the ocean, especially at high tide. Her rouge hair tangled in clumps in front of her eyes, soaked to the core from the salt water. Her normal brilliant bright eyes were dulled due to her tiredness. Laraine turned around to look at the sea as she caught a silent flash of fuchsia which she found very odd, and out of place. "What was that?" She thought to herself curiously raising an eye brow at the uncommon colour. "It's probably some type of fish." Laraine said aloud, before getting an idea. She was pretty hungry, so she figured she might as well try to catch it, and see if it was eatable. If it wasn't, she thought she might go back to the nearest market place and sell it for a pretty penny. "Brilliant idea!" Spoke a voice in the back of her head. "Go for it!" Laraine blinked and grinned. "Yeah, I'm going for it!" A few minutes later, Laraine had positioned herself on a nice rock near the cave entrance. She held onto a long piece of driftwood with some fishing twine that she happened to find on the beach. She had pulled off one of her earrings and tied it to the end of the line before tossing it in. Laraine waited silently for a bite, listening to the change in the wind. That's when she decided to sing an old lullaby her mother once sang to her. With her talented voice, the singing was lyrical and mystic attracting many different types of fish to bite her makeshift hook. "Ugh! I was really looking forward to that pink one!" Laraine grumbled, a stack of fish piled as high as her waist sitting right next to her. She wouldn't give up, and began to sing again, hopping that this time she would catch her prized fish. Kyra and the ice mare poured on more speed as the neared the middle of the lake once more, angled up and shot out of the water in a spinning of fuchsia,crystal blue colors and glimmering water drops. The girl let herself slide of the back of the sea serain and dove back into the water; left of the mare. 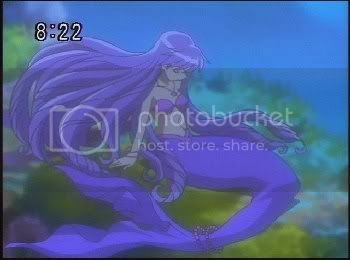 She did a quick turn and surfaced once more, this time using her tail to keep her a float. She laughed and brushed back a few annoying pieces of hair from her eyes. The crystal mare surfaced in front of her and nickered happily. She shook her nearly pearl white mane, sending more water shards everywhere, then nudged her bonded. Kyra smiled and embraced the mare in a hug, around Peace's nose. She stroked the elegant mare, "So, what shall we do now? My beautiful Peace," she said in her melodic voice. That was one she loved about this form of her's, she could sing so sweetly. An ocean voice some called it. Peace nickered again when Kyra embraced her in a hug. "I am going to go for a bit of dinner. Ok Kyra? I am getting a craving for sea moon Lilly's and grass," she said, her voice as soft as a clam breeze. "Ok, Peace. You go eat and I will be back in say an hour or so. I will go get somehting myself and check on the local sea life and see what's up." With that she turned and dove back under the water. She had picked up on the singing on wind, but many here could sing sweetly, so she didn't think much of it. She swam down to the very bottom of the lake where some coral grew; even with there be some fresh water present. It could grow because of the water tunnels behind it. The blue and pink giant sea plants towered over the mer and hid the entrance to the sea channel. Kyra swam through them and entered the ocean tunnel, it was a quick route to the sea and completely underwater, with only a few air pockets along the way. A few minutes later she felt the colder sea water and tasted the salt, she poured on more speed and fired out into the vast blue. She would go to the coral reef 100 yards off shore. see the earring and it got stuck in his dorsal fin. He thrashed around wildly, bleating and clicking in scared tones. Laraine, feeling a strong tug on her line. "Oh boy, this looks like a big one!" She yelled with glee as she struggled to her feet, pulling and twisting the line, trying to recover her prize. Though with all her efforts, the creature seemed to out power her greatly, seeing how it had the advantage of terrain on it's side. Laraine's feet dug deeper into the sandy cliff as she tried pulling back while raising the thin line. As her luck that day continued to worsen, Laraine slipped on the smooth sand and went flying head first into the sand, but that did not shake her grip. Now of the ground her found herself moving dangerously close to the cliff's edge. "Pull Harder!" Screamed the voice in her head as Laraine fussed, yelling back at it; "I'm trying can't you tell!" She sounded pretty annoyed at this point and the voice wasn't helping at all. She was now hanging perilously over he edge, teetering back and forward, her legs flaying all over the place and swinging tirelessly, trying to force herself back on to land. With one fatal tug on the line, Laraine was sent over board, flying through the air with an 'uh-oh' expression written on her face as she headed head first towards the water, -where which time seemed to slow as seconds felt like minutes- and landed in the freezing cold water with a huge slash. She felt herself sink to the bottom of the sea floor, her arms and legs crossed angrily as she sunk to the sandy bottom, her fishing rod broken and dismantled, floating right past her. She huffed angrily, bubbles spewing out of her parted lips. It looked as if the hunter had been hunted, or rather, caught in this case. Laraine soon figured out how long she could hold her breath, and it wasn't too long when she knew she'd drown if she didn't get air. It a futile attempt to reach the surface, Laraine tried swimming upwards, which wasn't working too well considering she was doing an imperfect breast stroke towards the surface. Tired, she sunk back to the ground and tried again, her air supply depleting more quickly then before. She started to feel waterlogged and light-headed. 'H-have to hold on... can't die here...' She thought swaying back and fourth, eyes closing slowly, her vision blurring into a darkness that threatened to consume her in an instant. Laraine could hear the voice, it sounded distant and afraid. "You can't die now! Laraine, stay awake, you've got to live!" It shouted urging her to try and move. Unfortunately, it wasn't working seeing how Laraine was fading faster now.